New results from NASA's Galaxy Evolution Explorer and the Anglo-Australian Telescope atop Siding Spring Mountain in Australia confirm that dark energy (represented by purple grid) is a smooth, uniform force that now dominates over the effects of gravity (green grid). The observations follow from careful measurements of the separations between pairs of galaxies (examples of such pairs are illustrated here). A census of 200,000 galaxies may confirm that the mysterious force of dark energy is what is pulling the universe apart at ever-increasing speeds, a new study finds. The results of the five-year galactic survey offer new support for the favored theory of how elusive dark energy works – as a constant force, uniformly affecting the universe and driving its runaway expansion. The galaxy survey, which looked at galaxies that were up to 7 billion years old, used data from NASA's space-based Galaxy Evolution Explorer (GALEX) and the Anglo-Australian Telescope on Siding Spring Mountain in Australia. "The action of dark energy is as if you threw a ball up in the air, and it kept speeding upward into the sky faster and faster," said Chris Blake of the Swinburne University of Technology in Melbourne, Australia. Blake is lead author of two papers on the study appearing in an upcoming issue of the journal Monthly Notices of the Royal Astronomical Society. Dark energy is thought to dominate the cosmos, making up roughly 74 percent of the universe. Dark matter, a slightly less mysterious substance, accounts for 22 percent. "Normal" matter, which consists of anything with atoms, or the materials that make up living creatures, planets and stars, makes up only about 4 percent of the universe. The theory of dark energy was proposed during the late 1990s, based on studies of distant explosions of dying stars called supernovas. Supernovas emit constant, measurable light, which make them useful guideposts for astronomers to calculate the dying stars' distance from Earth. By looking farther into space, scientists are effectively able to peer back in time, since the light we see from distant objects is light that left there billions of years ago. Astronomers observed many supernovas at different distances to determine how fast they are speeding away from us, and these measurements subsequently implied a strange force – dark energy – was flinging the objects out at accelerating speeds. The new survey provides two separate methods for independently checking these results. This is the first time astronomers performed these checks across the whole cosmic time span dominated by dark energy. 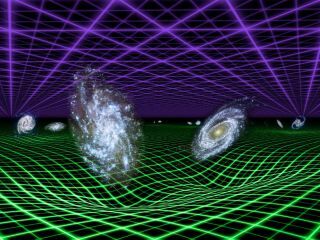 Astronomers began by assembling the largest three-dimensional map of galaxies in the distant universe, as spotted by GALEX. "The Galaxy Evolution Explorer helped identify bright, young galaxies, which are ideal for this type of study," said Christopher Martin, principal investigator for the mission at the California Institute of Technology in Pasadena, Calif. "It provided the scaffolding for this enormous 3-D map." This diagram illustrates two ways to measure how fast the universe is expanding -- the "standard candle" method, which involves exploded stars in galaxies, and the "standard ruler" method, which involves pairs of galaxies. Detailed information about the light for each galaxy was obtained from the Anglo-Australian Telescope, and the team of astronomers studied the pattern of distance between them. Sound waves from the very early universe left imprints in the patterns of galaxies, causing galactic pairs to be separated by approximately 500 million light-years. Blake and his colleagues used this figure as a yardstick to determine the distance from the galaxy pairs to Earth. Similar to the supernova studies, these distance data were combined with information about the speeds the galaxy pairs are moving away from us. This revealed, yet again, that the fabric of space is stretching apart faster and faster. The astronomers also used the galaxy map to study how clusters of galaxies grow over time like cities, eventually containing many thousands of galaxies. The gravitational pull of the clusters attracts new galaxies, but dark energy appears to tug them apart, and scientists are able to measure dark energy's repulsive force. "Observations by astronomers over the last 15 years have produced one of the most startling discoveries in physical science: The expansion of the universe, triggered by the Big Bang, is speeding up," said Jon Morse, director of the astrophysics division at NASA headquarters in Washington, D.C. "Using entirely independent methods, data from the Galaxy Evolution Explorer have helped increase our confidence in the existence of dark energy."